Pennsylvania enacted a long-term care insurance regulation on September 16th, 2002. Pennsylvania residents purchasing long-term care insurance after that date are protected by Pennsylvania’s Rate Stability Regulation*. The regulation has helped curb long-term care insurance rate increases in Pennsylvania because it forces long-term care insurance companies to lower their profits if they seek a rate increase. 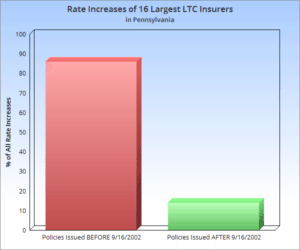 Of the 12 companies selling long-term care insurance in Pennsylvania today, 7 of them have NOT had any rate increases on any of the policies they’ve sold in Pennsylvania since the effective date of this regulation (9/16/2002). Approximately 81.65% of the long-term care insurance rate increases in Pennsylvania have been on policies purchased before September 16th, 2002. 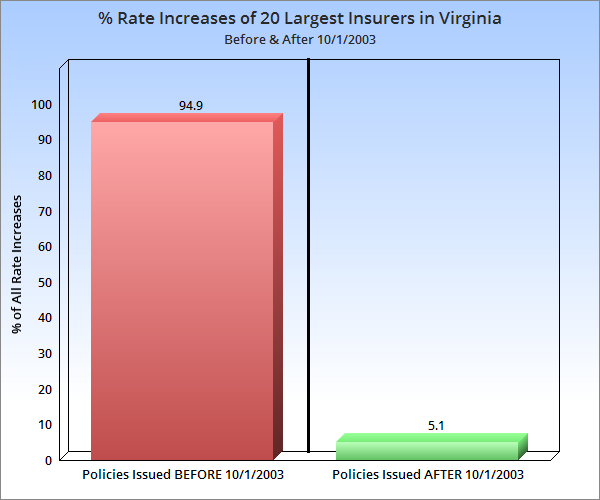 Policies purchased before September 16th, 2002 are NOT protected by Pennsylvania’s Rate Stability Regulation. Of the policies purchased after September 16th, 2002 which have had rate increases, the average rate increase has been 30.26% (cumulative). The median rate increase has been 25.00% (cumulative). Although these regulations are working very well in Pennsylvania, these regulations only apply to policies purchased in Pennsylvania after the regulation became effective. These regulations became effective in Pennsylvania on September 16th, 2002. All policies purchased after September 16th, 2002 ARE protected by these regulations.